Missions giving is on my mind. If there is a good form of pride I have it. I am as proud as I can be of the missions giving of our church. I crunched the numbers and did a double take when I realized that we have budgeted 19.1% for missions. This includes our local benevolence, our associational giving, our cooperative program giving, and our India missions support. Never have I served a church that backed up missions talk more. And the giving matters. I looked over some of Pastor Sam's emails from India today. Last March the Spring Revival meetings in Sircilla produced 456 public decisions to follow Christ. 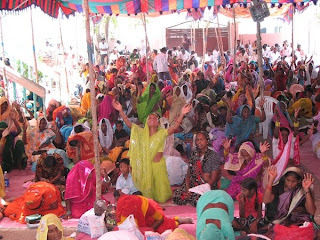 Last month 2,800 people from 197 villages attended Celebration Meetings where another 15 people were baptized. I am thankful we have the opportunity to participate in God's work in that part of the world. Could we do more? I'm sure the answer is yes. The late Larry Burkett said he believed God had blessed America so that we could provide the funding to fulfill the Great Commission. That may very well be the truth, but if we are to fund missions generously we must live within our means, stay out of debt, and budget our resources to reflect our values. Our missions giving could easily be 20% or even 25%. Wherever we end up next budget I am thankful, my generous God has placed me among generous people.